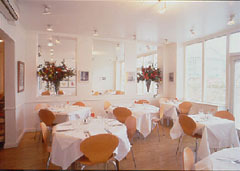 Situated in residential Putney, close to the Thames, the airy dining room features an extensive collection of modern art and offers modern British cuisine. Noteworthy artists include Ray Richardson, Keith Vaughan and Sonia Martin. The outdoor terrace is tastefully planted with bamboo, clematis, lavender, rosemary and thyme. Large umbrellas protect the terrace from direct sunlight, with patio heaters used in the evenings. 12.5% service charge. All major credit cards accepted.